Climate change is real and we recognize the risks it presents to our business and to the world. In this first of our three-blog series on Energy and Climate Change, we’re highlighting Newmont’s work to better identify the impacts of warming global temperatures on our business and societies. Mining, like all large-scale industrial operations, is energy-intensive and uses myriad energy sources including diesel fuel, coal, natural gas, electric grid power and renewable sources to run our operations. Fossil fuels are well known sources of greenhouse gas (GHG) emissions which trap heat in the atmosphere and lead to changes in our climate. The Tanami Desert of Australia, home to our Tanami gold mine, is one example of a geography that is seeing firsthand impacts of extreme climate events. December 2016 and January 2017 saw some of the highest levels of rainfall in the region on record. Flooding of the Tanami Highway threatened the safety of our employees and prevented delivery of fuel and other supplies. Normal operations were interrupted at Tanami for several weeks as a direct result of the record high rainfall and flooding. Decisions made today to manage energy more efficiently will impact our operating costs going forward and prepare the business for long-term success. We also recognize the effect that climate change mitigation legislation has on our global operating costs. In 2015, world leaders and governments signed the Paris Agreement, a worldwide action plan to limit global warming. 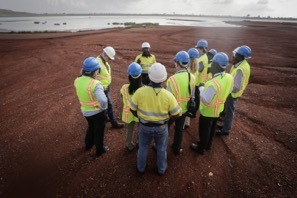 Carbon tax reform, renewable energy credit requirements and GHG emission reduction regulations are changing the way Newmont approaches existing energy needs and how we are planning for the future. Coming up next in this series, we will be sharing insights on how we are adapting our operations and providing assistance to local communities to address the physical impacts from climate change. For more details on our approach to energy and climate change, visit Beyond the Mine, our sustainability report.